The Autodial command is used to dial a phone number from the currently selected card. To use this feature you need to have a dialup modem connected to your PC. Position the insertion point somewhere in the number you want to dial from the notes information area. From the Card menu choose Autodial.... The Setup dialog box opens. In the International calls group box specify your own country code (for example, this will be 1 for U.S., 44 for U.K., and 90 for Turkey). 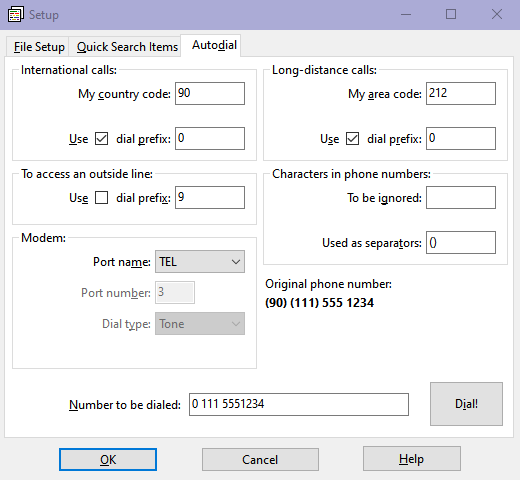 Enter also the prefix (the carrier code) which is needed to make international calls. In the Long-distance calls group box specify your own area code (for example, this will be 212, 332, 347, 646, 718, 917, or 929 for New York City; 20 for London; 212 or 216 for İstanbul). Enter also the prefix (the carrier code) which is needed to make long-distance calls. If you are behind a PBX, in the To access an outside line group box enter the number(s) you need to dial in order to access an outside line (for example, you can use 9w at work and nothing at home). For the meaning of special characters (like w) in a dial string, look at the AT command set of your modem. In the Modem group box specify the number of the Port to which your modem is connected. For example, if your modem is connected to COM1 or I/O Port A of your PC, specify 1. For COM2 or I/O Port B of your PC, specify 2. For USB, Bluetooth, or Infrared (IrDA) connections this may be 3, 4, or a larger number (see below). For Dial type select Tone or Pulse. If you are not sure what to choose, just test with Tone and if this does not work choose Pulse. All the above options are specific to a computer, so they are saved in user configuration when you click OK. In the Characters in phone numbers group box you need to give your preferences about how you format phone numbers in your Notes File. The characters To be ignored (the default is only the space character) are characters that are embedded in phone numbers but have no other meaning except to improve readability. The characters Used as separators (the default is parentheses) are characters delimiting country codes and area codes (if present) from the phone numbers. Examples are given below. The modifications you do in this group are saved in your notes file when you click OK. The Original phone number is a string selected from your card containing the phone number to be dialed including (possibly) the country and area code. This string is selected as follows: Starting from the cursor position a string including the numerals 0 to 9 plus the characters given above (Characters in phone numbers) is searched. This string must contain at least three digits. If end of card is reached before locating such a string, the search starts from the top of the card. The Number to be dialed is obtained after applying the rules detailed below. If you want, you can edit this number. To dial that number click on the Dial! button. A message will be displayed. Pick up the phone and click OK only after dialing is complete. Here, 90 or 11 is the country code and 111 or 212 is the area code in the original phone number; 555 1234 is the phone number; and 222/3 are some extra numbers we want to be ignored. In this example, if you include the dash (minus) character in the Characters to be ignored, then the phone number will include the 222 string also. From Windows Start menu select Programs | Administrative Tools | Computer Management, then go to the Device Manager under System Tools and click on Modems or just select Phone and Modem from Windows Control Panel. There should be an entry for your modem under Modems. Right click on it and select Properties. Go to the Modem tab and look at the port name at the top. This should be something like COMx. Enter the number x in the Port input box of the Modem group box of NOTEFILE. Open a Terminal and run the command dmesg | grep ttyS. Files like ttySx should be listed. If there are more than one, you should make an educated guess or try each one. To access a serial port, the Linux user that is running NOTEFILE should have write permission to it. In Ubuntu, this can easily be done by adding the current user to the dialout group: sudo addgroup your_user dialout. Normally, you should hear the dialing sound from your modem and you should click OK only after dialing is complete. If this does not happen and your modem does not dial the number, it is a good idea first to locate your modem as described above and then go to the Diagnostics tab and click on the Query Modem. This may solve some initialization problems you may have with your modem. If you enter wrong Port number in the Autodial tab of NOTEFILE you will get errors like File not found. In this case, please double check the modem number. It is generally a single digit number, but in some configurations it may be a double digit number. Dialing number... After number dialing finishes, please pick up the telephone and click OK.
After clicking the Dial! button, NOTEFILE will try to dial the displayed number. You should wait a few seconds while trying to hear the dial sound coming from your modem. When the above message is displayed, please wait until the dial sound is complete, then pick up your phone headset and click OK.